BRITE Transit will hold a public meeting to share the findings and alternatives for the 250 Connector Route Study on Tuesday, April 23, 2019 from 3:00-5:30 pm at the Waynesboro Public Library in Meeting Room A, 600 South Wayne Avenue. Members of the public are encouraged to attend to learn about the study and provide comment. The BRITE Transit Route Study is examining options for improving reliability on the 250 Connector route, which runs between Staunton and Waynesboro along US 250, serving major destinations like Augusta Health, WWRC, Walmart (Staunton and Waynesboro), Augusta County Library, and the Waynesboro Town Center. BRITE Transit is collaborating with the Staunton-Augusta-Waynesboro Metropolitan Planning Organization (SAWMPO), the Cities of Staunton and Waynesboro, and Augusta County, as well as a team of consultants. Study team staff will be available to answer questions and record comments. Join us to share your comments on improving public transportation services in your community! The Staunton-Augusta-Waynesboro Metropolitan Planning Organization (SAWMPO) and BRITE Transit will hold a public meeting for the Richmond Road Corridor Study and the 250 Connector Route Study on Wednesday, April 10, 2019 from 4:00 PM to 6:00 PM in the Staunton City Council Chambers, 116 West Beverley Street. Members of the public are encouraged to attend to learn about the studies and provide input. 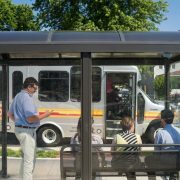 The BRITE Transit 250 Connector Study is examining options for improving service on the 250 Connector route, which runs between Staunton and Waynesboro along US 250, serving major destinations like Augusta Health, WWRC, Walmart (Staunton & Waynesboro), Augusta County Library, and the Waynesboro Town Center. Study team staff will be available to answer questions and record comments. Join us to share your comments on improving transportation facilities and services in your community! BRITE farecards are now available for purchase. Check out the WHSV TV3 1on1 interview with Bob Corso. 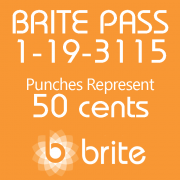 BRITE is pleased to introduce the BRITE twelve-punch farecards. BRITE farecards are available for 25 cent and 50 cent fares. These farecards will serve as an additional fare payment option, as an alternative to exact change and tokens. The 25 cent farecard will be sold for $3 and the 50 cent farecard will be sold for $5. Cards can be utilized on BRITE fixed routes and BRITE Access services. Punches will correlate to the respective fares. BRITE farecards will be available for purchase from the drivers on the buses, at the BRITE Transit Facility (51 Ivy Ridge Lane, Fishersville), and the CSPDC offices (112 MacTanly Place, Staunton). Passes hold no monetary value and are non-refundable. BRITE is not responsible for loss, theft, or destruction of passes. Passes that appear altered will be voided. 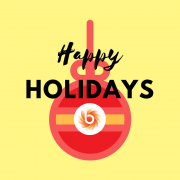 From December 10-January 2, WWRC will be a CALL STOP since students and teachers will be on break. If you have further questions, please call the customer service phone number at 540-943-9302. 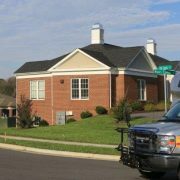 The regular November meeting time and location of the Staunton-Augusta-Waynesboro BRITE Transit Advisory Committee (BTAC) has been changed. The meeting has been rescheduled for Wednesday, November 14, 2018 at 1:00 pm at the BRITE Transit Facility located at 51 Ivy Ridge Lane, Fishersville. 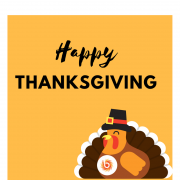 BRITE Transit is offering free rides on Election Day – November 6th. 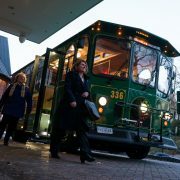 BRITE Bus routes serve many of the polling places in Staunton, Waynesboro, and Augusta County. Beginning October 15, BRITE Bus will be adding two stops in Fishersville. 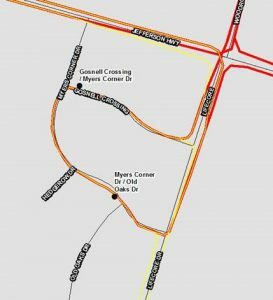 These signed stops will be in the Myers Corner development – one at Gosnell Crossing / Myers Corner Dr and the other at Myers Corner Dr / Old Oaks Dr – and will be served by the 250 Connector (Eastbound & Westbound). Benches and other amenities may be added in the future. 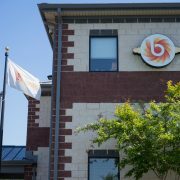 The regularly scheduled meeting of the BRITE Transit Advisory Committee for Wednesday, September 12, 2018 has been canceled.